It may sound obvious but every brand has its own method, so even if you dye your hair all the time, check through them first. If this is the first time you have used a color, do a skin test- put a dab of dye behind your ear and leave for 24 hours. Check the color you have chosen will work by first dyeing a small section of hair at the nap of your neck. Then if you are happy use for whole head. if you add color to freshly washed hair it may not work as well, so leave it unwashed 24 hours so the dye can work with your hair’s natural oils. Hair dye will stain any fabric so keep a dark towel just for when you color your hair. Step 1: Divide your hair into sections and it will be much easier to apply the color to your hair as you can work through it in a systematic way. Step 2: Make sure your hair is parted right down the middle from the front to the nap of your neck, you will then be able to disperse the dye evenly. Step 3: Apply a thick layer of Vaseline around your hairline, paying particular attention to your forehead and temples. This stops the skin around your hairline absorbing any dye, leaving obvious stains. Step 4: Stand in front of a mirror and apply the color to your hair gliding the bottle from the roots to the end. Work the dye into your hair so it’s fully saturated, but don’t rub into your scalp as it may stain or irritate your skin. Didn’t wear gloves and stained your hands? Try gently dabbing with cotton pad soaked in nail polish remover, don’t forget to wash your hands afterwards. Color gone brassy? neutralize the orangey tones by switching to a violet shampoo until your color calms down. Home highlights look badger like? re- dye your hair with a non permanent color that matches your natural shade. It will help soften the effect of those streaks. Shampoo every other day to stop your color fading and your hair dying out, and use an ultra gentle color care range. Skip conditioner for a few days after coloring. It can loosen the dye pigments and fade your hair color. 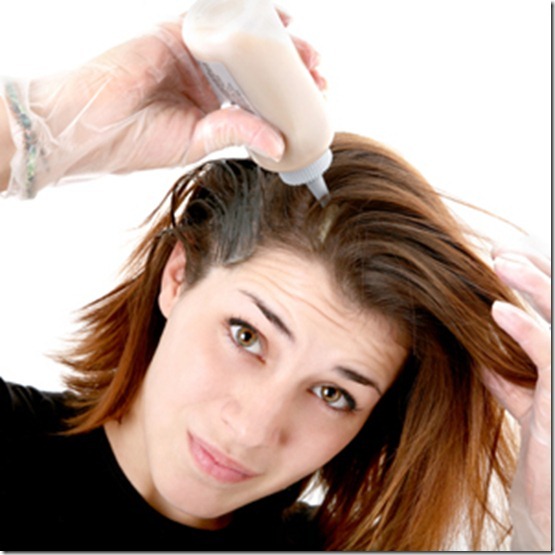 After that, use a product that is specially made for dyed hair.